Beauty Collagen supplements are a huge hit here in Asia and especially in Singapore! 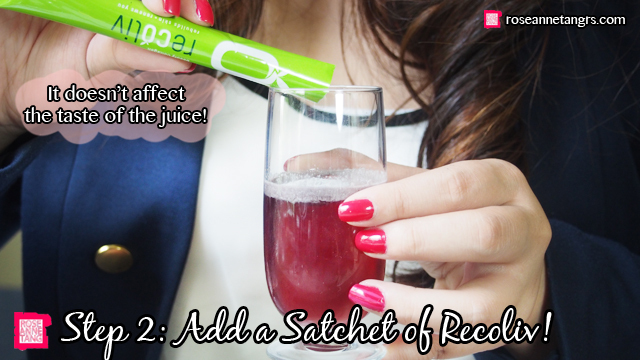 They’re consumed in either drink, tablet or powder mix form to help the skin regain elasticity and suppleness. In fact, collagen helps increase our own skin’s collagen production which is responsible for how firm and elastic our skin is. I’ve wanted to try it out for the longest time but the smell of collagen drinks originating from fish collagen really turned me off. Thankfully, I’ve found Recoliv which is from bovine origin (and thankfully odourless) and decided to jump the bandwagon with this to see what all this collagen fuss is about! 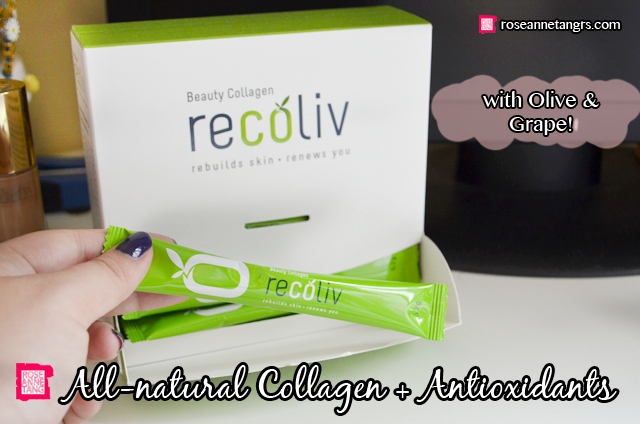 Recoliv is a skin rejuvenating product and the collagen inside is dervied from bovine origin made in Germany! The collagen is skin specific so that when consumed, it goes directly to the skin. It is also an all-natural fat free product that is free from additives, sweeteners and artificial flavourings. 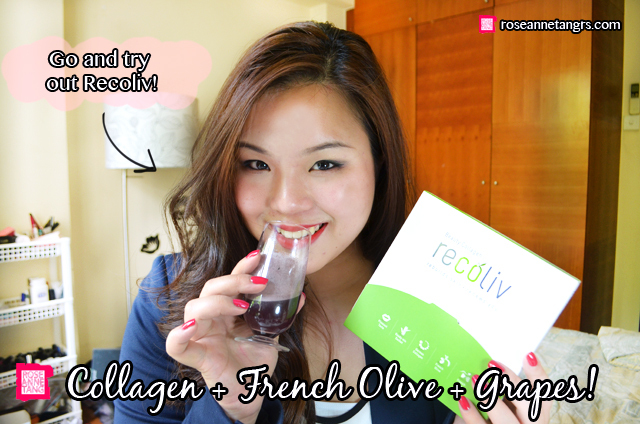 Recoliv is also a powerful trio of Collagen, French Olive and Grapes. The french olive and grapes provide additional potent antioxidants to slow down free radicals and reduce the process of aging. In fact, every satchet of Recoliv contains enough antioxidants equivalent to more than 1/2 a glass of red wine or 3 cups of red grapes! It’s definitely really good for you! In total, it helps to rebuild skin and renew you by reducing wrinkles, increasing moisture retention, brightening and improving how even our skin is and protection from UV damage. A lot of mums claim it helps with cellulite and sagging skin after child birth too! 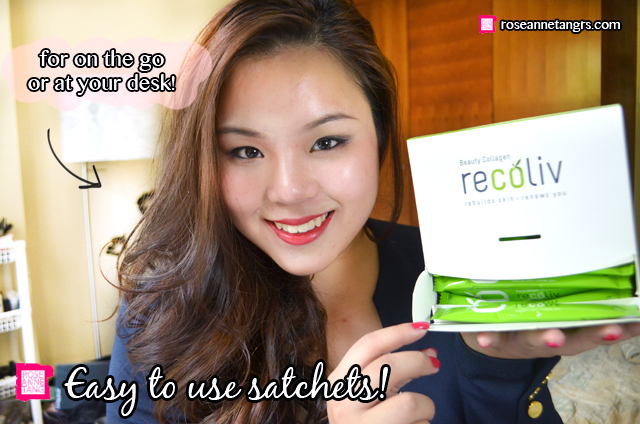 I love how the sachets are so easy and the box actually helps dispense them. You can take one on the go to your office or take it in the mornings. I usually take mine right after I wake up and you can mix it with your favourite juices and even milk. Just be sure you avoid drinking Recoliv with alcohol, coffee or tea and extremely hot drinks because this can affect the productivity of the collagen protein. I thought why not show you how I make mine! I love grape juice. I love all things grape and I reckon that because Recoliv has grape and olive extracts, it would be the perfect juice to go with. I’ve tried it with just water and it doesn’t taste bad at all. It has that slight olive and grape tinge to it that is pleasant and I don’t smell a strong collagen smell at all! 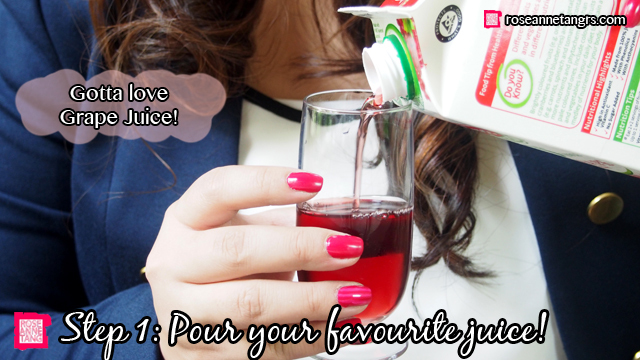 I just like mixing it with juice because it makes an overall yummier and more exciting drink! Add a sachet and then stir it up! 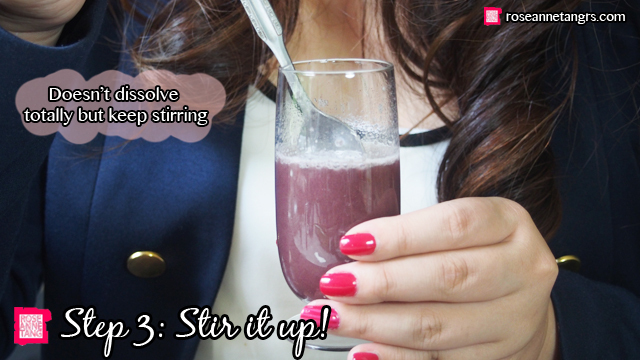 It doesn’t dissolve that easily to be honest so you might want to stir a little bit more than usual. You’ll also see that there’s a bit that won’t dissolve at all but it’s totally fine. After mixing it up, enjoy! It’s delicious and tastes just like grape juice – mainly because it is grape juice. I look forward to drinking this all the time. In fact, I wish sometimes I can drink it more than once a day. It’s recommend though to have it once a day! So did I see results? Yes. My skin for sure felt much firmer and not just my face but around my thighs and arms as well. I’m actually quite impressed! I tried Recoliv for a whole month so it might take about 2 – 3 weeks to see results. Recoliv is made by NCI which is established in 2004. It is a wholly owned subsidary of Natural Colloids Industries Pte Ltd that has a long history in the food ingredients industry. It was the first to bring in collagen for joints to Singapore and has been a popular product since. 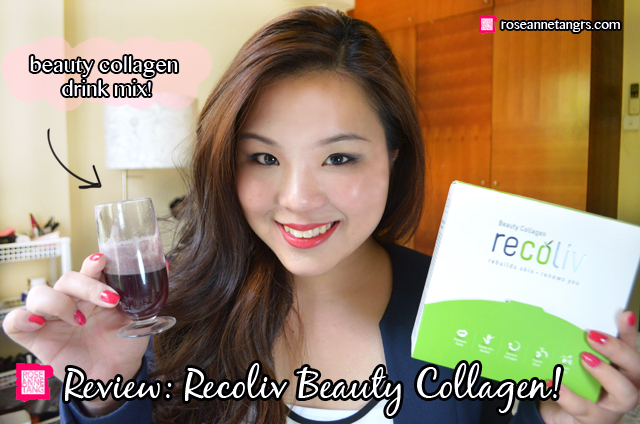 This year, Recoliv is a new addition to the company’s collagen products that targets the skin. 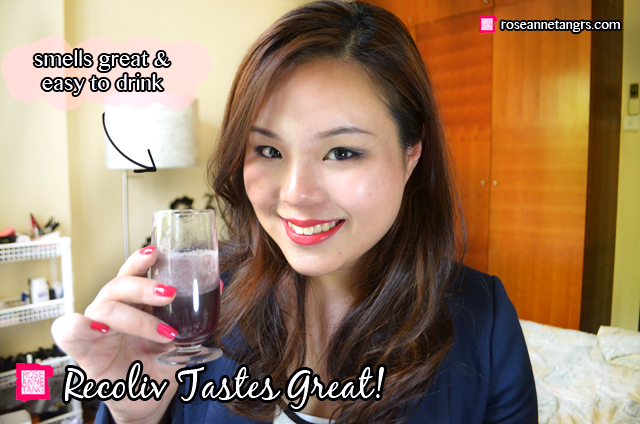 Overall, if you’re looking for a collagen drink at the moment and hate the fishy smell of some other products – try Recoliv! It is basically odor-less and easy to add and mix into your favourite juices 🙂 Plus, it works! Also wanted to let you know that Recoliv is having an instagram contest called Spread the Joy! Every week, 4 winners will win a pair of movie tickets each! All you have to do is instagram your concept and tag #JOYrecoliv and a friend! Good Luck! CC Cream Overview: Comparing & Reviewing Six Best Selling High End/Department Store CC Creams! My SK-II Videos with Clozette & SK-II Pitera Essence Set GIVEAWAY! You look so different in your photos from this post! In a good way really haha and your face is glowing. That drink must really be something!